According to Global Exchange, an international human rights organization based in San Francisco, there are more than 1,200 coffee roasters in the U.S. Aside from the consumer who ultimately purchases, brews and drinks coffee, the coffee roaster is the end of the line in a complex supply chain that involves tens of millions of people, including producers in 50 coffee-growing countries; those who process the green coffee (often a business separate from growing and harvesting); exporters who sell and importers who purchase coffee in order to move it from producing to consuming countries; and finally, roasters who ready it for the consumer by bringing their own philosophies to bear, whether traditional or renegade, on how our cup should taste. Sometimes their efforts to develop roast profiles specific to each coffee’s variety and origin are an exercise in fulfilling consumers’ desires, and sometimes their work is about shaping tastes, either predicting the next trend or introducing coffee-drinkers to new styles or presentations they hope will take hold and create fresh opportunities for their brand. Roasters command the highest profit margin of all the players in the supply chain, so it stands to reason that their demeanor in the global marketplace—their responsibility, or lack thereof, in developing relationships with others in the chain—influences not only partnerships with growers, but also the quality of the final product. Since the early 2000s, when the term “third wave” was coined, roasters have been pushing the envelope in terms of sourcing small, very selective lots of coffee by direct trade (as opposed to working through exporters), roasting these lots lighter to highlight, rather than obscure, the qualities of specific coffee varieties and origins, and intensifying their support of environmental practices that encourage sustainability, from practices at the farm level to packaging decisions and equipment purchases. In trying to identify trends among newer roasting companies, we turned our attention to coffees roasted by businesses in operation for five or fewer years. We cupped 40 coffees from 25 different roasters, most located in the U.S., save for one in Taiwan and two in Canada. Our only criterion for submission was how long the company itself has been in the roasting business. Some leaders of these new companies were active in the coffee industry for some time before starting their own companies, while others are completely new in the field. While 25 is a small sampling, given the number of new roasters in the U.S. and the world, it did give us a sense of what matters to new roasters, especially those in the U.S.—what they’re doing well and what their challenges are in this long-established, yet still burgeoning, segment of the industry. The 40 coffees we cupped ranged in score from 79 to 94; the average score was 90. We review the 12 top-scoring coffees that attracted a rating of 91 or higher. All of the roasting companies represented here are either micro-roasters or nano-roasters, generally defined by the capacity of the roasting machines employed and the volume of roasted coffee produced each year. Roast Magazine considers micro-roasters those who produce less than 100,000 pounds of coffee per year and typically roast in machines whose capacity is between 20 and 50 pounds. Nano-roasters are even smaller, using roasters that hold between a half-pound and 20 pounds of green coffee and roast under 200 pounds per week, in total. We noticed a few trends among the roasters that earned the highest scores. First, even though most of the roasters we feature here offer a range of coffees from different origins, roasted in different styles, the coffees roasters chose to submit for consideration in this article were all roasted from medium-light to light. We received only two samples that even edged into the light end of dark. The lightest-roasted of the top-scoring coffees showed a whole-bean M-Basic Agtron reading of 60 on our instrument, while the darkest was 52, putting it, at most, at the darkish end of medium. Perhaps this speaks to the continuing trend among third-wave roasters toward lighter roast profiles that accentuate the individual characteristics of different green coffees, rather than the use of green coffee character as a complicating foil for the pungent pleasures of darker roasts. Interestingly, though, while the top-scoring roasters offer coffees from multiple origins, most roasters chose to showcase, at least for the purposes of submitting for this report, coffee types that might be considered “classic” rather than experimental. Of the top 12 coffees we review here, four are Kenyas, two are Colombias and one is a washed Ethiopia. The outliers that performed well include one Papua New Guinea, one honey-processed Ethiopia, two natural-processed Ethiopias, and one blend. The most represented origin among this month’s top-scoring coffees is Kenya, a coffee-producing country long respected for the impeccable processing practices of its cooperatives, its auction system, and its historical success with the admired coffee varieties SL28 and SL34. Kenya coffees are popular among consumers who value brightly complex acidity in balance with sweet fruit and floral tones. 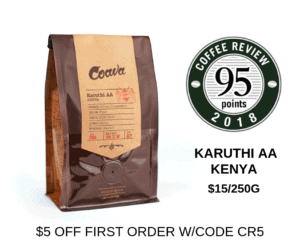 Per’la Specialty Roasters’ Kenya Nyeri Giakanja AA (93; Miami, Florida) is a delicately tart coffee with lush tropical nut and bright citrus tones and an exuberant finish. Propeller Coffee’s Kenya Kangocho (93; Toronto, Canada) displays a floral-savory structure, supported by chocolate notes and rich aromatic wood. The Kenya Othaya from States Coffee and Mercantile (93; Martinez, California) is richly savory and sweetly herb-toned: an unapologetically classic Kenya. Rounding out the fine Kenyas is Daily Offerings’ Kenya AA Top Kirinyaga (92; Lexington, Kentucky). Jeff Ross, roaster at Daily Offerings in Lexington, Kentucky. Colombia, another reliable source of classic coffees, placed two representative coffees on this month’s top-rated list: one from trees of the rare Pink Bourbon variety from Sweet Bloom (94; Denver, Colorado), a complex, sweet-toned, spicy cup, and the brand-new Charlotte Coffee Company’s Gustavo de Jesus Rivera Microlot (93; Charlotte, NC), a fruit- and floral-toned, graceful cup, satisfyingly complete in structure. Washed-processed Ethiopias lead the way in the elegance department, known for their juicy, floral-toned balance and delicacy. Greater Goods’ Ethiopia Celinga (91; Austin, Texas) is such a coffee: crisply sweet, delicately though richly floral, with a hint of spice intrigue throughout. Co-owner Khanh Trang on the roaster at Greater Goods in Austin, Texas. Five coffees that represent less classic types also made the list of our 12 top-scorers. Park Avenue’s Papua New Guinea Kimel Estate (94; St. Louis, Missouri) is a resonant, flavor-saturated coffee with suggestions of pomegranate and grapefruit blossom. Papua New Guinea has excellent highland terroir for growing coffee, but rugged, largely roadless terrain and infrastructure challenges often create obstacles to quality. The Kimel Estate offering, however, is a cleanly classic and balanced, quietly exotic in its aromatics. Most of the great, classic coffees of Ethiopia represent a splendidly original variation on the clean, bright wet-processed style. But because of climate change and drought in producing countries, as well as a trend among up-market coffee roasters toward fruit-forward flavors, natural-processed (dried-in-the-fruit) coffees are being broadly embraced among many aficionados. We’ve cupped hundreds of natural-processed coffees in the Coffee Review lab in the last few years, many of which are Ethiopias, and the results vary, from heavily fermented coffees that score in the 80s, just into specialty grade, to lyrical, sophisticated naturals with enticing fruit tones in balance with florals, nuts, chocolate, and aromatic wood. One of two natural-processed Ethiopias in this month’s 12 top-rated coffees is Nobletree’s Ethiopia Limu Kossa Geshe (93: Brooklyn, New York), a lush, fruit-forward coffee with a winy acidity and velvety mouthfeel. The other is Ragamuffin Roasters’ Kayon Mountain (92; Newbury Park, California), a fruit-toned cup that hints at sweet fruit ferment, but gets ballast and depth from rich cocoa notes. Another global specialty trend is honey-processed coffees, in which skins are removed but all or some of the fruit flesh or pulp is allowed to dry on the beans. 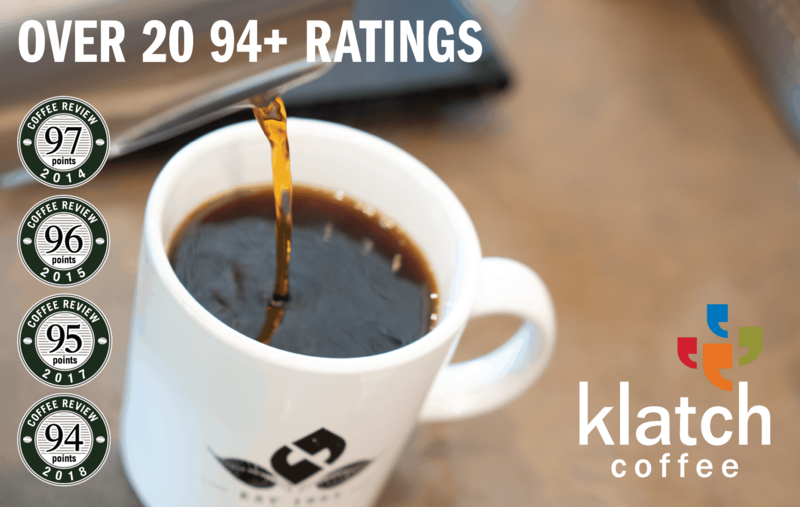 Taiwan roaster Kakalove Café submitted a lovely honey-processed Ethiopia Guji Suke Quto (93), both delicate and rich in equal measure, offering notes of lemon curd and nougat in a satiny-smooth, juicy cup. The lone blend in our top 12 is “B People,” from Rhetoric Coffee, a company launched in December, 2015 (91; Berkeley, California), composed of coffees from four different origins, roasted to slightly different levels and combined for a zesty, savory-sweet cup. In our exploration of new coffee roasting companies, several themes emerged that underscore how practices associated with specialty coffee’s “third wave” have maintained momentum among newer roasters, notably an emphasis on direct trade, a commitment to sustainability (both economic and environmental), and a focus on education of both in-house staff and consumers. Though Sweet Bloom Coffee was founded a mere four years ago, its principals have 40 years of combined experience in the coffee industry, which founder Andy Sprenger says allows them to offer stability within the ever-changing leading edge of specialty coffee, by making them less likely to chase fads and more likely to focus on the tried and true. Sprenger has placed in a number of national and international competitions, including U.S. Brewers Cup, World Brewers Cup, Roasters Choice Award (SCAA) and U.S. Tasters Cup. The company’s business model puts a spin on direct trade by inviting representatives from the farms they buy coffee from to their Colorado roasting facility for “Meet the Producer” events, which encourage transparency, trust and long-term relationships. Roaster Wee Jin Chiew, of Sweet Bloom Coffee in Denver, Colorado. Kritie Kotze, co-founder of Daily Offerings Coffee Roastery in Lexington, Kentucky, says that, while developing direct trade relationships with growers is a challenge for those new to the specialty coffee industry, it remains a priority in terms of Daily Offerings’ long-term quality goals. Kotze and her husband, Lood, a South African winemaker, see parallels between the world of wine and specialty coffee. They opened their roastery in 2015, after moving to Kentucky from Paso Robles, California and receiving formal roaster and barista training. Their goal is to develop relationships with producers whose farming practices align with their own values and whose coffee they can promote locally, in much the same way that direct trade relationships work in the wine industry. Canadian roaster Propeller Coffee, founded in Toronto in 2013, also centers its business model around direct trade, which allows control of the final product as much as possible. Co-founder and co-owner Geoff Polci says that Propeller’s goal is to source 80 to 90 percent of their green coffees directly from farmers, to ensure the best quality as well as generate a fair price for producers. This is a widely shared goal among the roasters featured in this report. Propeller Coffee’s team in Toronto, Canada. Dale Schotte, owner of Park Avenue Coffee in St. Louis, Missouri, which began roasting coffee in 2013, thinks that one of the most successful aspects of Park Avenue’s business model is an eco-friendly roastery, which includes a 50kw solar array and 200 solar roof panels, all LED lighting and a Loring air-roaster, which is 91% more energy-efficient than a traditional drum roaster. Keith Gehrke, a long-time member of the coffee community as roaster for Victrola, Flying Goat and other companies, founded States Coffee in 2015 in the San Francisco Bay Area suburb of Martinez, where he is drawing in local customers for coffee roasted on-site. He reports that the wholesale side of the operation is most challenging because of intense competition in the specialty coffee space. Gehrke’s answer is to broaden the scope of his brand with the addition of a mercantile space that showcases artisan-crafted products of all kinds from across the country, with the goal of establishing a community identity. In addition to their commitment to direct trade, husband-and-wife team Trey Cobb and Khanh Trang built Greater Goods on a philanthropy model, color-coding their coffee bags to indicate which charity sales of a particular coffee supports. Their current partners are all Texas non-profits, including the Central Texas Food Bank, the Autism Society, Boys and Girls Clubs of the Austin area, and Austin Pets Alive. Jay Gestwicki, founder of Charlotte Coffee Company. Shawn Pritchett, co-owner of Ragamuffin Coffee Roasters in Newbury Park, California. Courtesy of Nicole Goodwin. The specialty coffee industry is a volatile one, to be sure, with climate change on the front burner and researchers working urgently to create disease- and drought-resistant hybrids that still produce exceptional and distinctive coffee. Roasters occupy a unique position in the global supply chain, one that requires responsibility, business savvy, and a communal mindset. If the 12 roasters we feature here are harbingers of the future of this segment of the industry, then coffee-lovers are in good hands.